Supplemental information for California residents. Your California Privacy Rights: California privacy law requires us to provide California residents with specific disclosures about our privacy practices, including telling you about the information we share with other third parties for marketing purposes. You may request a copy of this information on an annual basis by contacting us at privacy@crunkenergy.com or writing to us at Solvi Acquisition, LLC, 8840 Commons Blvd., #150, Twinsburg, OH 44087. We collect personal information, such as name, postal address or email address only when you submit it an email request or online form. If you contact us by email, you agree that by initiating such communications, we may send you email and other communications related to your initial or subsequent requests. Except as set forth above, you will be notified when your business or personal information may be shared with third parties, and will be given the option to prevent the sharing of this information. Security. We use computer safeguards such as firewalls and data encryption, we enforce physical access controls to our buildings and files, and we authorize access to information only for those employees or distributors of CRUNK!!! who require it for their job responsibilities. This policy does not apply to companies we do not own or control, or to individuals we do not directly employ. In operating our web site, we may transfer business or personal information to distributors or suppliers who may be located outside of the U.S. In these circumstances, we will comply with laws applicable to such transfers and will take steps to ensure that people outside the U.S. take appropriate steps to protect business or personal information in accordance with applicable laws and this policy. Changes. We will post information on the web site home page, if we make any significant changes to this policy. Questions. Contact us at privacy@crunkenergy.com if you have questions or concerns about our privacy practices. This web site is owned and maintained by Solvi Acquisitions, LLC for CRUNK!!! (“CRUNK!!!”). Intellectual Property. CRUNK!!! is a protected trademark in more than 40 countries. Applicable copyright, trademark or patent laws protect the materials contained in this web site, as well as other intellectual property assets owned by CRUNK!!!. Unless you have been granted written permission or license, you may not use any part of this web site, or any other intellectual property of CRUNK!! !, including its trademarks and service marks, on any other web site or other printed or electronic materials. Systematic retrieval of data or other content from this site is specifically prohibited. Links. This web site includes links to other Internet web sites, provided for your convenience. We do not warrant the reliability or accuracy of content contained in any other web site. You should read the privacy and security policies at these sites. Children. We do not knowingly collect information from children under 13 on this site and do not believe that our web site is targeted to young children. 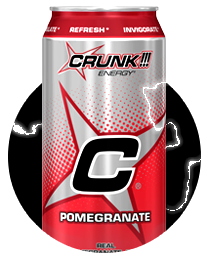 If you are a parent who believes your child has provided us with information, please contact privacy@crunkenergy.com.